BOOK COVER SAYS: Final Solutions, Dance Like a Man and On a Muggy Night in Mumbai have been staged to critical and public acclaim all over the country and abroad, and his radio plays, Seven Steps Around the Fire and Do the Needful, have been aired on BBC radio. 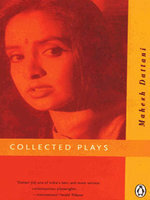 The plays in this collection are prefaced by introductions, which provide fascinating insights into the plays-in-performance in the context of Indian and world theatre. These eight plays, widely varied in thematic and stylistic content, are a tribute to the dramatic vision and skill of a man who has transformed the face of urban theatre in India. SWARNALI SPEAKS: Okay, by now you should have realised that my love for Dattani's works have no bounds :P Don't blame me please,his works are depressingly addictive. So no wonder I picked up another book of his. this is more of a collection of almost all his plays including a few radio plays that were broad casted on BBC. This collection includes 8 of his plays. On a muggy night in Mumbai - This is a pioneer work in Indian English drama where homosexuality was openly discussed, breaking all barriers. Dattani attempts to remove the social prejudices regarding the so called "not-so-normal" people who are a major part of our society and the reason why they are made to remain in the closet. The stigma they face from both the society and their own group and family is severely criticized by Dattani. The tale of Prakash who is absent throughout more than half of the play, his arrival on stage and the end comes as a brilliant twist. Dance like a Man- Dattani being himself a trained dancer in Bharatnatyam tries to bring out the prejudice our society has towards male dancer, especially the ones trained in Classical forms. We have come to the 21st century now,but our ideas are still the same orthodox one where we believe that dancing makes a man effeminate. Dattani attempts through his to eradicate this notion that art chooses you and practicing any art form does not change the person you are. There are many other issues that are raised like the responsibility of the parents regarding the future and health of their children. Is it always the mother who is in charge of taking care of the children or is it also the father who is equally responsible. The end maybe mistaken as a very misogynistic one but on a deeper level Dattani gives a very different message. Others include Final Solutions (he received the Sahitya Akademi award for this one) and Where there is a Will. Each and every story has a surprise end,so be prepared to be shocked and I can bet,you'll never know how the story ends until you reach it. The remaining two are radio plays.